I was going through some of my old gaming documents this week and came across this little gem. I always like putting a new spin on things as it usually leads to the players doing a double take or scratching their heads as they wonder why their tried and true methods aren't working. Everyone seems to perk up and take notice once they realize not everything is as it seems. If it's done well - especially if it's done cool - they won't even mind that you might be taking some liberties with the rules as written, such as in the case of alternative spell effects. The entire document I unearthed includes a number of skeleton variants that I'll make a second dedicated post about later. For now, here are some ideas on how to set the scene and plan out your next encounter that involves skeletons. The average skeleton is a pretty straight-forward opponent. Being generally mindless, its tactics are simple - tear apart whatever living creature is within reach. It attack with its claws, maybe an old blade with which it died with long ago, and it protected by whatever armor it might have been wearing at the time. The standard array of undead traits aside, a skeleton's key defensive abilities include damage reduction and immunity to cold-based damage. Rather than being just a "meatless"-shield between the PCs and their objective, a creature GM can find new purposes for this old monster. Below are a few ideas for how you can use skeletons in your next encounter. A swarm of insects may have taken up residence in the vacant skull or a coiled viper might drape itself over the rungs of the rib age. Either way, a meddlesome adventurer is going to find that he has disturbed more than just the restless dead when he goes to dispose of the next skeleton. Alternatively, it's also possible that a "sleeping" skeleton gets caught up in the undulating mass of a passing ooze. The acidic secretions of these amoeboid creatures typically have no effect on non-organic material, allowing the skeleton to be carried for miles without incurring damage. Larger oozes may accumulate several skeletons over time, unwittingly travelling with its own small host of undead. Magic spells can be recorded on a variety of mediums, from rolls of papyrus and stone tablets to inked tattoos and illuminated decks of cards. Some clever necromancers have taken to inscribing important spells on their minions. Although this isn't as efficient as more traditional means, it does provide the spell caster with a certain element of surprise. Although the script is plainly visible, it's impossible for onlookers to interpret any of it while the skeleton is in action. On fact, only when the skeleton remains completely stationary, can the arcane script be read coherently. Unfortunately, the destruction of the skeleton also means the destruction of the spell if it was not cast first. Since positive energy is notorious for reducing the undead to ash, there is no chance of recovering a spell bared by a skeleton that is annihilated in such a manner. The crushing damage of a weapon makes the recovery of a spell possible, although not necessarily easy. Between shattered ribs, crushed femurs, and broken phalanges, the task of piecing together a destroyed skeleton can be a daunting chore for even the most patient individual. 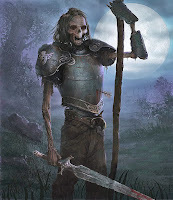 While this spell is traditionally used to prepare a skeleton corpse for animation as a zombie, it can also be used to bolster an existing animated skeleton. Although an animated skeleton cannot be turned into a true zombie with this spell, it can alter its appearance and increase its vitality. As the targeted skeleton regains flesh, it also gains temporary Hit Dice in accordance with its size. In addition, it replaces its DR 5/bludgeoning with DR 5/slashing. The DC to correctly identify a skeleton that has been affected by restore corpse, and its special abilities, increases by 5. Skill checks that fail by 5 or more misidentify the undead creature as a zombie. This use of the spell has a duration of 1 minute. 1 This does not include bonus hit points from other sources, such as a high Charisma score or the Toughness feat. Restore corpse can be countered and dispelled by decompose corpse. Mythic: You may target the skeleton of a Large or larger sized creature.